1) Wash and cook toor dal / Yellow split pigeon peas in pressure cooker with 3 cups of water, turmeric powder, asafoetida and a drop of oil and keep it aside. 2) Soak tamarind in hot water for 10 minutes and extract paste from it. 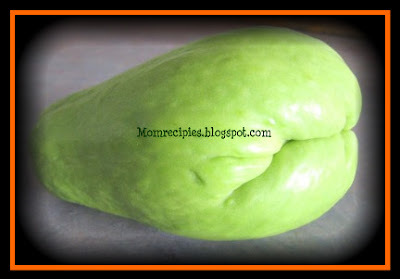 3) Wash and cut the chayote into small cubes and keep it aside. 4) Chop onions, and green chillies. 5) Boil chayote pieces in cooker or microwave oven and keep it aside. 6) Once the dal is cooked Open the cooker,strain the water on top,(keep this aside and add lastly to the sambar if too thick)and mash the dal well with the round end of a ladle. 7) Heat ghee /oil in a pan/kadai, add mustard seeds, cumin seeds afte they splutter add red chilly ,little asafoetida, splutter , curry leaves, black gram dal, fenugreek seeds.Saute for 1 min then add green chilly and onions.sprinkle little salt and fry for some time. 8) Add red chilly powder, coriander powder, sambar powder and fry for some time. 9) Now add tamarind pulp ,jaggery /sugar ,cooked dal and allow it to boil for some time. 10) Add vegetables and water if required. 11) Check salt and the consistency of the sambar,as it should not be too thick or too watery.Boil for 10 mins. 12) Finally garnish with chopped coriander leaves and grated coconut. 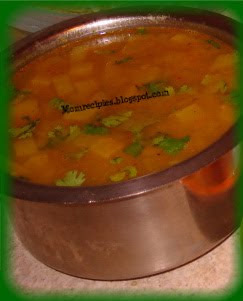 Tasty chayote sambar is ready to be served. 13) It can be served along with white rice, idly, dosa etc. This recipe is called Chow Chow Sambar in Tamil and Seema Vankaya / Bengaluru Vankaya sambar in Telugu.